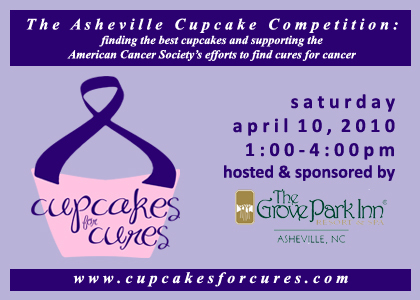 Cupcakes for Cures is a special event taking place April 10th in Asheville, North Carolina, to raise money to cure cancer. It takes place from 1 to 4 pm at The Grove Park Inn (290 Macon Avenue) and looks like a great event. Visit www.cupcakesforcures.com for more information. Professional bakers, amateur bakers and youth bakers will compete for bragging rights and fantastic prizes all while raising funds to find cures for cancer. Bakers can enter multiple culinary creations in true Asheville categories: Best Beer Cupcake, Best Gluten-Free Cupcake, Best Holiday and Special Occasion Cupcake, Best Birthday Cupcake and Best Local Foods Cupcake. Bakers should visit www.cupcakesforcures.com to enter. The deadline for entries is Wednesday, April 6 at 5:00pm. The Grove Park Inn, www.bakeitpretty.com, and Greenlife Grocery are major sponsors of the event and will send judges to the competition. The Grove Park Inn is the host sponsor and is providing the grand prize, their Bed, Breakfast and Dinner for Two Package. Other judges include Marcianne Miller, author of The Artful Cupcake: Baking & Decorating Delicious Indulgences and Mackensy Lunsford, food editor for Mountain Express. There's also an e-card you can send to let people know you're competing. * Best Birthday Cupcake: a cupcake that screams birthday to someone who’s 5 or 50. * Best Gluten-Free Cupcake: a cupcake that excludes ingredients derived from gluten-containing cereals: wheat (including kamut and spelt), barley, rye, and triticale. * Best Holiday or Special Occasion Cupcake: Halloween, 4th of July, Weddings and Baby Showers, there are so many occasions to enjoy cupcakes. * Best Beer Cupcake: Asheville is Beer City USA after all. Two requirements for this category: beer is used as an ingredient and only contestants 21 years and older can enter a cupcake in this category. You can also fan Cupcakes for Cures on Facebook and we look forward to hearing how it went and posting photos from this exciting event. This is so cool!!!! I am making cupcakes for Easter this weekend.